One of the dosage forms available for Methimazole is Twist-a-Dose Transdermal Gel. A Wedgewood Pharmacy exclusive. 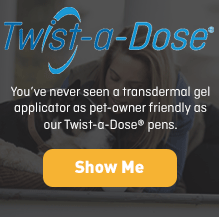 We dispense transdermal gels in our exclusive Twist-a-Dose® applicator. 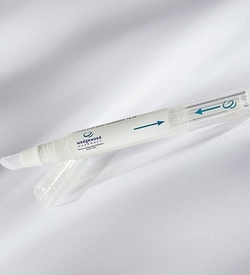 With just two steps, a no-mess applicator, and no tiny markings to read, you can rest assured that patients will receive the prescribed amount of medication while reducing exposure to the pet owner. Wedgewood Pharmacy understands the need for alternative routes of delivery when oral dosing is not a feasible option. Wedgewood Pharmacy recommends that you consult with a pharmacist before you prescribe a transdermal medication. 76 strengths of Methimazole Twist-a-Dose Transdermal Gel are available, ranging from 0.1 mg/0.05ml to 15 mg/0.05ml. Methimazole is also available in these dosage forms. Different strengths may be available for different dosage forms. For veterinary professionals: Order from our 20,000-preparation formulary. If you have any questions concerning these medications, please consult with your doctor. These articles from PetMD may be of interest to you. Pick up or refill now. For pet owners: Pick up and fill a new prescription for your pet or refill a current prescription. Just click ! Print this page now to share with my veterinarian.